Michael Patrick Hoomanawanui (/ˌhoʊʔoʊməˌnɑːwɑːˈnuːiː/ HOH-oh-mah-NAH-wah-NOO-ee; born July 4, 1988) is an American football tight end of Māori and Hawaiian descent who currently plays for the New Orleans Saints of the National Football League (NFL). He was drafted by the St. Louis Rams in the fifth round of the 2010 NFL Draft. He attended the University of Illinois. Hoomanawanui who is of Māori and Hawaiian descent attended Epiphany Elementary and Junior High School and Central Catholic High School in Bloomington, Illinois. He was a Chicago Tribune and Chicago Sun-Times First-team All-State selection and a First-team All-Cornbelt Conference selection after making 50 receptions for 843 yards and 12 touchdowns as a senior. Also, he led team with 139 tackles and eight sacks on defense. Hoomanawanui also lettered in basketball during freshman, sophomore and junior years. As a freshman he played in 10 games, starting three at tight end. In 2007 he played in 11 games, starting five at tight end. As a junior, in 2008, he earned Honorable Mention All-Big Ten honors by both the media and coaches after playing in all 12 games and eight starts at tight end. He ended the season with 25 catches for 312 yards and two touchdowns. In the 2009 season Hoomanawanui played in eight games, starting five. He ended the season with 10 receptions for 114 yards. All values from Illinois Pro Day. Hoomanawanui playing for the St. Louis Rams in 2010. He was drafted by the St. Louis Rams in the fifth round of the 2010 NFL Draft. On June 26, 2010 he signed a four-year, $2.4 million contract including a $215,000 signing bonus. During his rookie year in 2010, Hoomanawanui played 8 games (started three) making 13 receptions for 146 yards and three touchdowns. In 2011, he started eight games making seven catches for 83 yards. He was cut on September 2, 2012. 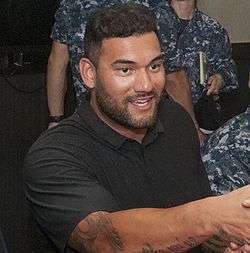 On September 5, 2012, Hoomanawanui signed with the New England Patriots. During his first season with New England in 2012, Hoomanawanui played 14 games (started six) making five catches for 109 yards. He made his first career postseason start in the AFC Championship in a 13-28 loss against the Baltimore Ravens. On April 15, 2013, Hoomanawanui signed his free agent tender to remain with the Patriots. During the 2013 year, Hoomanawanui appeared in 13 games (started 10), made 12 catches for 136 yards and a one-handed touchdown catch in a loss to the Miami Dolphins. His efforts helped the Patriots to the AFC Championship again, only to lose to the Denver Broncos 16-26. On March 10, 2014 it was announced Hoomanawanui re-signed with the Patriots for an additional two seasons. During the 2014 year, Hoomanawanui played 12 games (started six), made three catches for 44 yards. Hoomanawanui earned his first Super Bowl appearance after the Patriots' 45-7 win over the Indianapolis Colts in the 2014 AFC Championship Game, where he had one reception for six yards. Before that, he recorded four catches for 43 yards in the team's 35-31 Divisional round victory over the Baltimore Ravens. During Super Bowl XLIX against the Seattle Seahawks, Hoomanawanui caught one pass for four yards in the first quarter. Later in the fourth quarter, following an interception by Malcolm Butler, a fracas broke out between the two teams as Hoomanawanui was involved. Despite the spoiler, Hoomanawanui received his first career championship title as the Patriots won the Super Bowl 28-24 over the Seahawks. On February 6, 2015, Hoomanawanui was fined $8,268 for his involvement in the brawl. On September 30, 2015, Hoomanawanui was traded to the New Orleans Saints in return for Saints defensive lineman Akiem Hicks. He mainly played at fullback and as a third-string tight end in blocking situations, catching 11 passes for 76 yards and three touchdowns in his season with the Saints. On September 3, 2016, Hoomanawanui was placed on injured reserve. ↑ Thomas, Jim (2012-09-01). "Rams claim 2; Hoomanawanui, Ojinnaka cut". St. Louis Post-Dispatch. Retrieved 2012-09-03. ↑ Wilson, Aaron. "Source: Patriots resigning Michael Hoomanawanu to two year deal". Nationalfootballpost.com. Retrieved 10 March 2014. ↑ Brett Martel, "Saints trade DT Hicks to Patriots for TE Hoomanawanui", Associated Press at Boston.com, September 30, 2015. ↑ Gantt, Darin. "Saints cut Khalif Barnes, Travaris Cadet in getting roster to 53". NBCSports.com. ↑ "MICHAEL HOOMANAWANUI". New England Patriots. Retrieved 30 December 2013.